We are well versed in design & manufacturing of custom rack mount enclosures. We are known for offering a highly efficient range of Sheet Metal Enclosures. Our fabricated enclosures are used with electrical equipment and are fabricated using superior grade raw material to ensure durability. Furthermore, with the help of our quality controllers, we test the entire range strictly on various parameters. Cool Dolly: These Mobile units are used at Airports to transfer Cargo from warehouse to Aircrafts. Temperature of - 20 to + 20 degree centigrade can be maintained as per requirement. We are engaged in Manufacturing & Exporting of Enclosure For Ups, we manufactured by them with the high quality rawmaterial & this highly demanded by the large organisations. We provide stainless steel temperature sensor enclosers. They are powder coated and external earthing is also provided along with it. 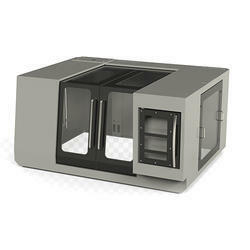 Our range of sensor enclosures have a smooth finish and custom made designs. Following are the various available types of temperature sensor enclosers. The POPE Professional® 2U, 4U, 8U & 12U Amplifier Case-19 Inch is built for the long haul. The cases crafted from raw edged materials to accommodate power amplifiers up to 2U, 4U, 8U & 12U. The cases are built smart with dual rack rails for mount the equipments front and rear.